The Navy has awarded Austal $261.8 million for work on the construction of two Expeditionary Fast Transport vessels. 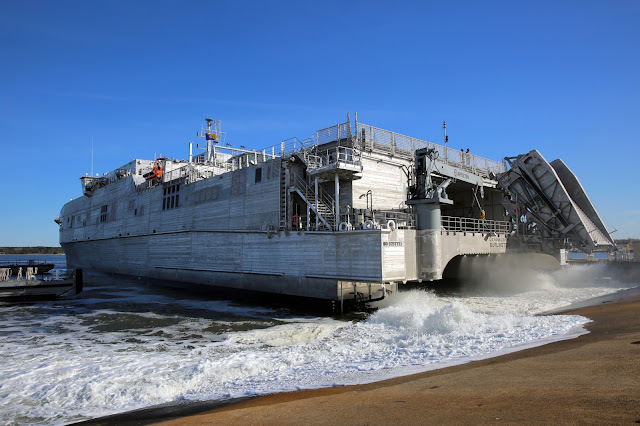 I guess any amphibious transport is good amphibious transport but I have a bit of trouble understanding the utility of these ships and why the US Navy would seek to have more than 6 much less 14. The pics shows the vessel damn near on the beach which was a capability I didn't know it had. Additionally I know it planned to operate with the sea base as far as 200 miles off shore. What I wonder about is its capability in high seas. Lastly I have to wonder about the Navy's "Battle Fleet". If this class of ship is considered part of the planned 350 then is that number credible? Circling back I guess I end where I began. Any amphibious transport is good amphibious transport.